The Affordable Housing and Fair Mortgage Bill 2018 has been written by Master of the High Court, Edmund Honohan, with the aim of enacting government policy in such a way as to keep people in their homes. Introduced in the Dáil last July, the bill highlights Ireland’s adherence to EU law and the European Convention on Human Rights in the context of the housing crisis and, in particular, mortgage arrears. 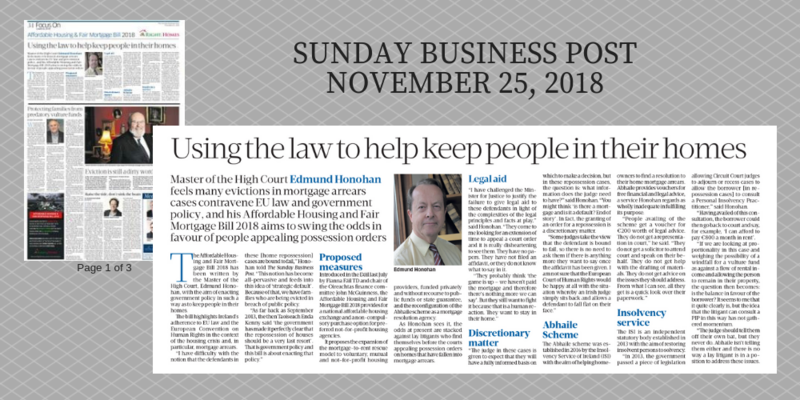 “I have difficulty with the notion that the defendants in these [home repossession] cases are bound to fail,” Honohan told The Sunday Business Post. “I feel that this notion has become all-pervasive and feeds into this idea of ‘strategic default’. Because of that, we have families who are being evicted in breach of public policy. Introduced in the Dáil last July by Fianna Fáil TD and chair of the Oireachtas finance committee John McGuinness, The Affordable Housing and Fair Mortgage Bill 2018 provides for a national affordable housing exchange and a non-compulsory purchase option for preferred not-for-profit housing agencies. It proposes the expansion of the mortgage-to-rent rescue model to voluntary, mutual and not-for-profit housing providers, funded privately and without recourse to public funds or state guarantee, and the reconfiguration of the Abhaile scheme as a mortgage resolution agency. As Honohan sees it, the odds at present are stacked against lay litigants who find themselves before the courts appealing possession orders on homes that have fallen into mortgage arrears. “I have challenged the Minister for Justice to justify the failure to give legal aid to these defendants in light of the complexities of the legal principles and facts at play,” said Honohan. “They come to me looking for an extension of time to appeal a court order and it is really disheartening to see them. They have no papers. They have not filed an affidavit or they do not know what to say in it. “You might think ‘is there a mortgage and is it a default? End of story’. In fact, the granting of an order for a repossession is a discretionary matter. “Some judges take the view that the defendant is bound to fail, so there is no need to ask them if there is anything more they want to say once the affidavit has been given. The Abhaile scheme was established in 2016 by the Insolvency Service of Ireland with the aim of helping homeowners to find a resolution to their home mortgage arrears. Abhaile provides vouchers for free financial and legal advice, a service Honohan regards as wholly inadequate in fulfilling its purpose. “People availing the scheme get a voucher for €200 worth of legal advice. They do not get a representation in court,” he said. The Insolvency Service of Ireland (ISI) is an independent statutory body established in 2013 with the aim of restoring insolvent persons to solvency. “In 2013, the government passed a piece of legislation allowing Circuit Court judges to adjourn or recess cases to allow the borrower [in repossession cases] to consult a Personal Insolvency Practitioner,” said Honohan. then go back to court and say, for example, ‘I can afford to pay €800 a month in rent’. “If we are looking at proportionality in this case and weighing the possibility of a windfall for a vulture fund as against a flow of rental income and allowing the person to remain in their property, the question then becomes: is balance in favour of the borrower? “It seems to me that it quite clearly is, but the idea that the litigant can consult a PIP in this way has not gathered momentum.